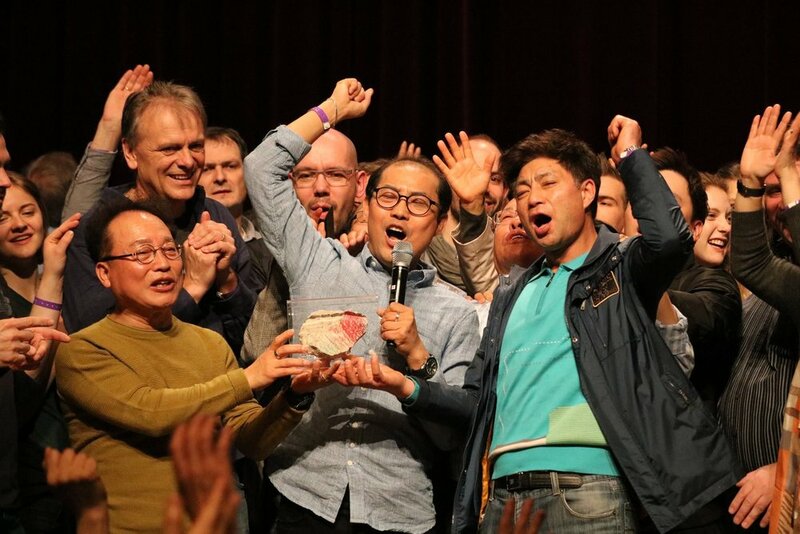 We have archived all 7 sessions from the 2018 Global Gathering in Korea on YouTube in 6 languages: Korean, English, Mandarin (Chinese), German, French, and Arabic. Chinese archives are also available on Livestream. Scroll through playlist to select your preferred language. 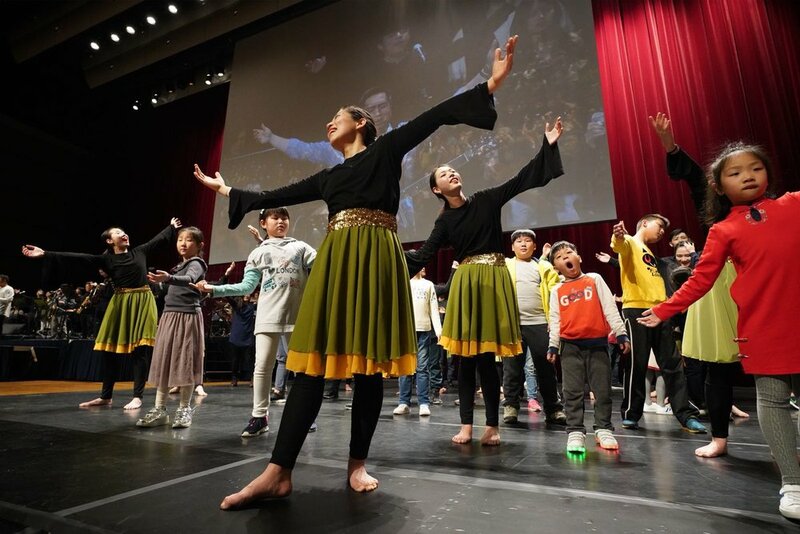 The 2018 Global Gathering in Jeju, Korea started with Korean, Chinese, and Japanese mothers greeting the global family. There was a great excitement and expectancy. We are a family of love with an open heaven above us. It doesn’t matter what our background or culture is – we are one in Jesus! There is a spirit of unity bringing us together like never before. We entered into a time of worship with dancing and singing: Lord You are good and Your mercy endures forever! We worship You for who You are! All generations danced together in many circles within one another. There is freedom in my Father’s house! We’re falling deep into the Father’s heart! We wanna see Jesus lifted high! We declared together: Be lifted up oh Ancient doors! Fling wide you ancient gates. For the King of Glory is here. Who is this king of Glory? Who is strong and mighty? El Gibbor, the Lord mighty in battle! We cast down our crowns and worshipped together singing We exalt Thee and You are worthy of it all. Together in His awesome presence, we bowed down in a posture of reverence, our foreheads touching the ground, in honor of El Gibbor, mighty God. Similarly to how an airplane in a holding pattern circles around in the air above a busy runway awaiting clearance to land, the Lord is looking for a clear runway to land. How do we prepare the runway for Him to land? The Lord wants a family who loves one another, who connects deeply, heart to heart, with one another, a family who is one. We need to prepare the runway because the Lord is in a holding pattern, hovering and waiting to land. Lord, enlarge the capacity of my heart for the family. A kingdom divided will not stand, so make us one Lord. Lord, I don’t want my heart to be a busy runway, but I want to clear the clutter and I want my heart to be a prepared place for You to land. Here’s my heart Lord, not busy anymore, but free and clean. Land in my heart Lord! Cleanse my mind. Cleanse my eyes. Cleanse my emotions. I am Yours! The different parts of the body work and function together in harmony. The head leads the members of the body and the body will exalt the head. We have come together in unity to exalt our King Jesus Christ! As ONE bride, we sang to our Bridegroom to fulfill the covenant He initiated: We Surrender All and I am my Beloved’s and He is mine... I am my Beloved’s, we are Yours! In the past, the Japanese have caused pain to Korea and China, but through God’s love and patience they have been brought together in love. Never again do we want to be separated from our Korean and Chinese family. From such a deep place of love, they asked the Koreans and the Chinese if they would enter into a marriage covenant with the Japanese. Chinese from all over the world have resolved to set aside any historical events that divided them. They have declared that they will walk together united in the Lord to build up a spiritual family as a resting place for God. Their heart says: the Korean family will not need 17 years to come into unity. Can a nation be born in one day? Yes! United Korea can be born in one day! Although growing in unity has been a long road of struggles and learning to walk in humility, it has been so worth it! Their hearts responded with a "yes!" to the Japanese proposal to enter into a deeper level of unity through a marriage covenant. We are the Bride of Christ and now is the time to practically walk in unity, to be prepared for our coming King. Satan fears our unity and so he’s tricked us for many years, causing much division. But no longer! We will be one with the nations - one body, one church, one family of God. 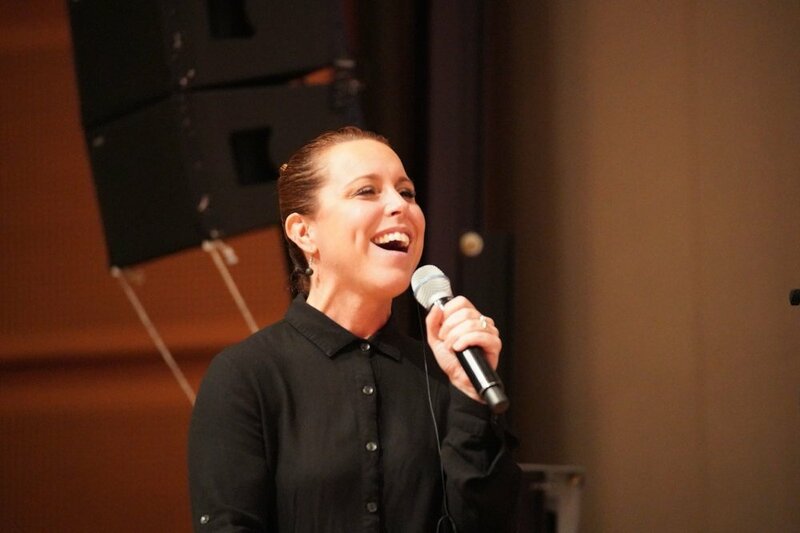 A joyful and powerful freedom was released in worship. 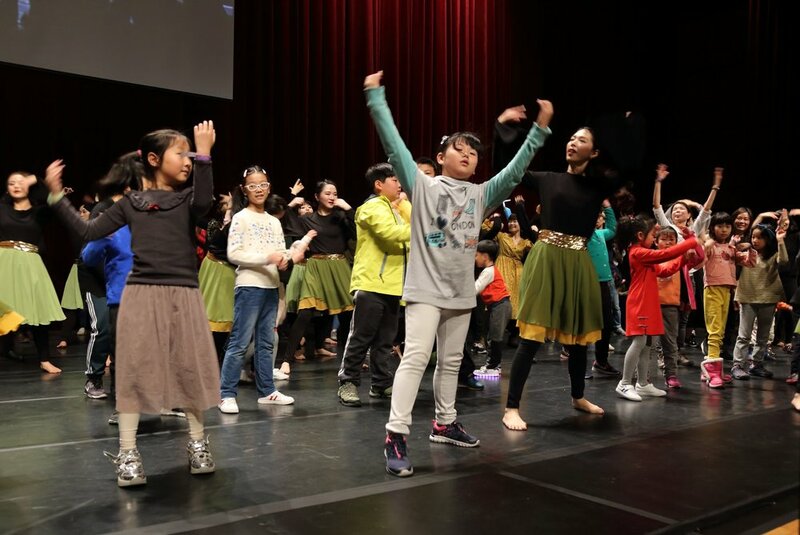 A circle was formed on stage and many creative expressions of dance were released from the young people and children! Suddenly there was a shift and the Lord took us into a deep stillness. Then a deep cry was released and we felt the longing of our Father’s heart for us. We offered a clap of thanksgiving for His heart towards us. Our hearts overflowed with gratitude and thanksgiving to the Lord! The Governor of Jeju Island proclaimed a blessing over our time together. Korean Leaders came to the stage and led a time of corporate prayer for the governor, blessing him to lead Jeju Island righteously. We also prayed that this city and that all of Korea will glorify the name of Jesus! However, just before the prayers, there was an outburst by some North Koreans – now living in South Korea – who objected to some of the Governor’s comments. This lead to a time of prayer, repenting for the dynamics within the church in South and North Korea. Let’s continue praying for those in North Korea. Lord, only You can truly heal deep wounds. So we stand together with our family in both halves of Korea. Lord, let us see You as the breakthrough and history maker. The Korean family responded to the proposal for covenant made by the representatives of the Japanese and Chinese families in the previous session. They indicated that their hearts' desire was the same – and that they too had wanted to propose this! They accepted, responding with: With all our hearts we want to enter this covenant with you! We need you! We want to be one with you! We love Japan! We love China! We are one in Christ! The bride is making herself ready by being united as ONE! The Japanese presented the Koreans with a beautiful gift: a tie for a kimono. This tie is traditionally worn by Japanese women after a wedding ceremony. A Chinese mother proclaimed this covenant to be a blessing to the nations. All the young people gathered to witness the Chinese, Japanese and Koreans proclaim WE ARE ONE! As we went into a celebratory middle eastern expression of worship, everyone from different nations embraced each other as one family of God! We came together welcoming the Lord with shouts of joy! On stage, the tribal people, with their drums, danced around the crown of Jesus as it was being lifted high, above all else. With the young people from all the nations in the front, there was a prophetic cry released for our Lord Jesus Christ to receive His inheritance – the nations! The Lord has brought us to a season of acceleration, as many of the younger generations are being brought into what the Lord is doing very quickly, as if the plowman is overtaking the reaper – Amos 9:13. The generations celebrated each other for their dedication to the works of our God. The younger generation was overwhelmed by the love the older generations showed them - both having longed to see the day when they would walk altogether as one – Jeremiah 32:39. The Lord is knitting us, not in projects, but in our hearts! He is knitting us together because He is a father, and we are His family. Our Father loves us so much and we are so precious to Him. Not wanting to live without us, He died in order for us to be in relationship with Him. He gave a new command: love one another. This is a higher standard. He commanded us to not only love our neighbour as yourself – but to love as He has loved us. His love is becoming our love to one another. This is His end time army. How will they know we are His disciples? Not by miracles and power, but by the love we have for one another. With this season of acceleration we felt the Lord will miraculously circumcise our hearts, healing them towards each other! The Lord said He would not have a wounded bride but one who is whole and ready for those He is about to bring into His kingdom. Through many tears and with genuine hearts, we cried out – Lord, circumcise our hearts and take away the flesh, fill it with the Holy Spirit. Many people hurt us, and we too have hurt many – knowingly and unknowingly – and yet He still loves us. People hurt us, but we will love. The measure of the love we are looking for is “as He loved us”. Lord, I want the bar You have set by Your standard. Because we want the world to know that we are Your disciples. Change our wounded hearts of stone and make them hearts of flesh. Allow our hearts to soar again! Open the gates! Set the birds free so we can fly again! We don’t want that cage to protect us. You are our protector. And if we get hurt again, Your blood is available to heal our hearts! We want to walk as one heart, one body, one love! Father, if we have any unforgiveness towards anyone - any pain in our hearts from abuse or what people did to us – we forgive now! We speak release to these people. And if we have hurt anyone, and have been a stumbling block to others, Father, we repent. Cleanse our minds, cleanse our hearts. Heal our hearts! Because this is the body that will see the healing of the lands. We also prayed for healing in our families, our churches, our cities, our nations. 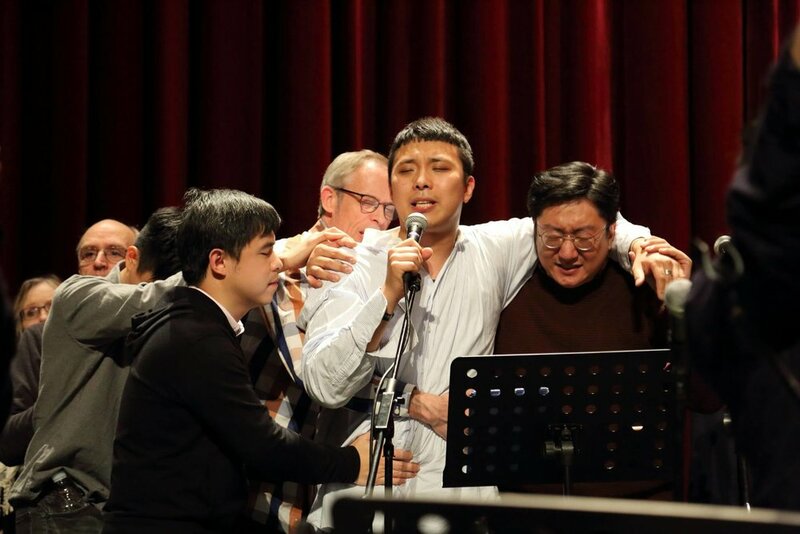 Israeli Arab and Jewish leaders imparted healing, as they have received from the Lord, to those families who are wounded and in deep pain in Korea, all China, Japan and far eastern Asia. All healing is received collectively, by faith, remembering that our high King has prayed for this in John 17. Members of the German family came to the stage to release their hearts for Korea. They carry a burden for the Korea, having experienced being a divided nation with divided families because of a political issue. Through Germany, the Lord released the cry “Bring the walls down”, as they clasped their hands over Korea and travailed together. Now is the time! Bring the walls down! The Boonon tribal group from Taiwan beat their drums and sticks on stage, as if brick by brick the wall was coming down! The Lord then called the nations to stand in the gap for North Koreans. Not to just pray for them, but to pray as one of them, as said in Hebrew 3. It’s important that as we pray, we identify with others’ experience and pain. We’ve all been praying “Let my people go!” The Hebrew word used is שָׁלַח – which is translated, “Send forth!” The word that implies and contains an apostolic directive. The Lord led us to declare to the powers over North Korea “Send My people forth!” The harvest is great but the labourers are few. As they will be released, the North Koreans will be sent forth to walk in their destiny. The end time apostolic mission of the Korean nation cannot be fulfilled without the North Koreans. If you want to find your strength, look for where the enemy hits you the most. The enemy is hitting Korea with disunity. Korea, you will help the nations come into oneness. You are going to be a healing power for the world. The Germans blessed the Koreans saying we love you, along with the Chinese proclaiming they will stand with the Koreans. With the many who had joined the Gathering through the web stream, we are a people both personally in the same hall, and across the nations. Multiple thousands across the world are standing with Korea for her breakthrough. Korea, you will not leave our hearts. We will stand with you until we see the breakthrough! A number of North Koreans shared deeply from their hearts about their and their families past and present experiences and heart aches. Many tears were shed from the global family as the time of sharing brought us into a deeper level of heart connection and embracing one another. To protect their identities and that of their families who are still in North Korea, this part was not broadcast. We were reminded of the journey that Lord had invited us into over the last few months, where He kept taking us deeper into His heart. This was emphasized during the 40 Days of Yielding in November and December 2017. At the Tribal Gathering, in Malaysia, in February 2018, the Lord extended a proposal to Malaysia: will you marry Me? At first, this seemed strange, but then the Lord explained: I want a proposal because I am preparing for a wedding and this is My bride. When a man proposes to a woman, as she accepts, she becomes bound to him, and is no longer available to anyone else. She enters under the covering of that man. There is a new level of bonding that the Lord is looking for in the body. 1 Corinthians 6:17 “But he who is joined to the Lord is one spirit with Him.” The word “joined” here in Greek is κολλάω (kollao) and means to firmly join together. This is similar to a strong glue placed between two surfaces. These surfaces can no longer be separated without damage to both. Whoever is joined to the Lord can no longer be separated. As we yield ourselves and are “glued” to each other, we are all one in Him. The many nations who were represented in Malaysia responded together with a sure “YES” to the Lord’s proposal. It was felt that this was a foretaste of what the Lord will do in Jeju. The Lord revealed that there is yet a deeper level that He is preparing us to step into. He wants to “betroth” us to Himself. This is a level He desires for His whole body globally. The betrothal process in Mosaic law is different than our modern day engagement. It is much more serious. It is a full legal marriage, with all the rights and obligations, however the marriage is not yet consummated. Mary was not just a virgin, but a virgin betrothed. God called us, as His bride, to be like Mary, a virgin betrothed, with the fear of the Lord and angels surrounding us. He impregnates us with kingdom of Jesus. God desires us to see our lives differently, to live out a whole different level of purity, walking in the fear of the Lord. He wants us to live like betrothed and pregnant woman, physically weak, but full of the glory of God. As we walk into a room, His kingdom comes, and people sense it, yet we are walking in the fear of God. With holiness, power and authority, we carry His kingdom. Mary carried His first coming, we, His Church, are to carry His second coming. As we are betrothed and legally His, we enter into a deeper level of commitment and surrender as never before. Together we entered into this new place of surrender, holiness and glory through the covenant of communion. Family will you love the Lord forever? We will. We will. We will. Family, will you be the faithful one? We will. We will. We will. My bride, will you be the faithful one? We will. We will. We will. We are every colour. We are every language. We are every people. We are Yours. We are one heart. We are one heart. We are one heart. The Lord is preparing one body, one bride, dressing us up in army boots and marching us forth to possess and proclaim, to take back for the Lord all that the enemy has stolen. As His Body, from many colours and tribes and nations, we join together in the spirit and we are one spirit with Him. The Lord told us, “Now ask of Me – ask for yourself, for your family, your parents, your children, your church, your ministry, your business, your finances, your health. You have not received, because you have not asked. Ask in faith and it shall be given!” An authority to speak this out was given to us because of the deeper unity we received with Him in betrothal. Speak it out and claim it in faith! The tribal family worshipped beating their drums, as we declared that the rulers and kingdom of this world will bow down and the King will run to the ends of the earth. 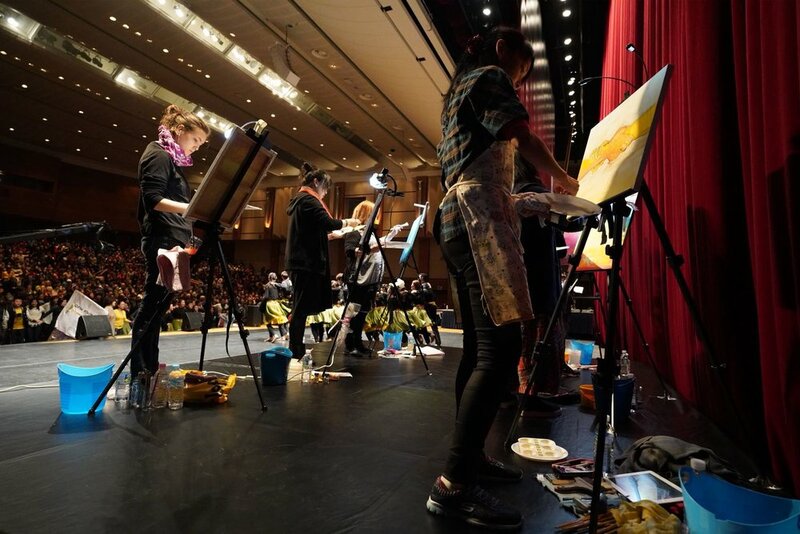 A representation of both North and South Korea went on stage, surrounded by a representation of leaders from the global family. They spoke to North Korea saying, “It is time!” We heard that the angels are here, waiting to be released on their assignments. We spoke to the angelic hosts that have been assigned to North Korea, “Release! Release!” We spoke to the powers over North Korea, “Send my people forth! Send my people forth in my apostolic mission!” What the enemy intended for evil, God will turn to good! The God of mercy will go and change hearts. We want each one to find the saving power of Jesus Christ! 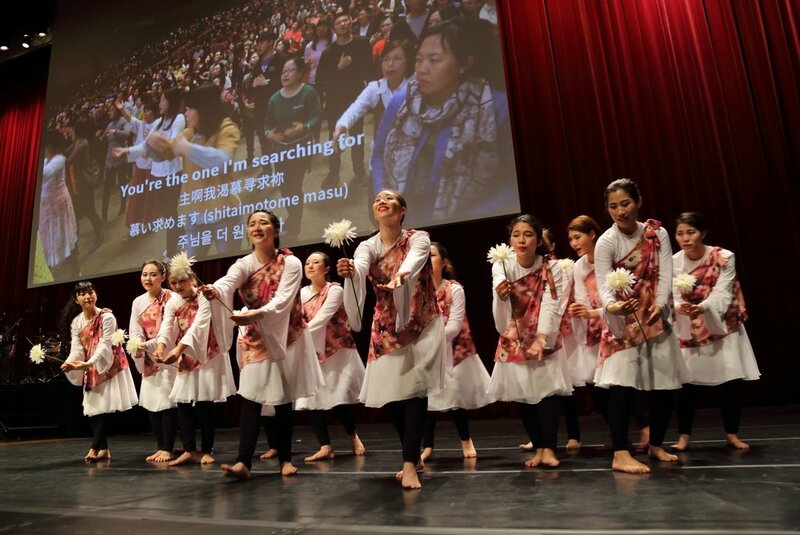 Representations of the great world powers involved in the dividing of Korea – China, Japan, US and Russia – gathered on stage and, each in their own language, prayed over the two Koreas, blessing them and proclaiming ONE Korea over them. 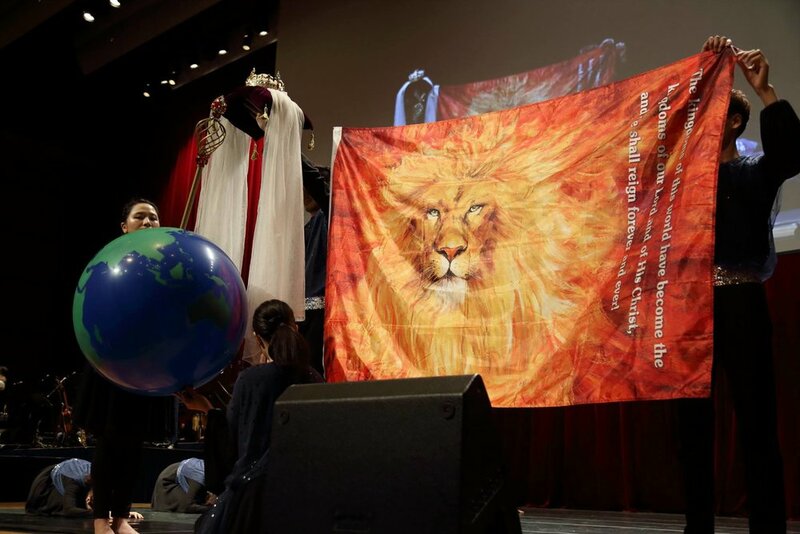 We closed our time together with a great roar from the Lion of the tribe of Judah! New man birthed in fire, moulded by God’s hands, given to North Korean pastors as gift. We are being called to the wedding. North and South Korea as twins in the womb of God. The eagles, symbolizing the prophetic, are protecting the womb and birthing. The flames represent the passion and zeal of this generation bringing an awakening across the earth. The Lord’s strong arm is pulling Korea into freedom and unity. The Lord desires to become One with the people of Korea, like the grafting of the branch to the true Vine, Jesus Christ! Painted when North Korean family were sharing their story. I felt a deep rootedness in Christ’s love that would break open our hearts to birth new beginnings and the courage required for this vulnerable, painful process. 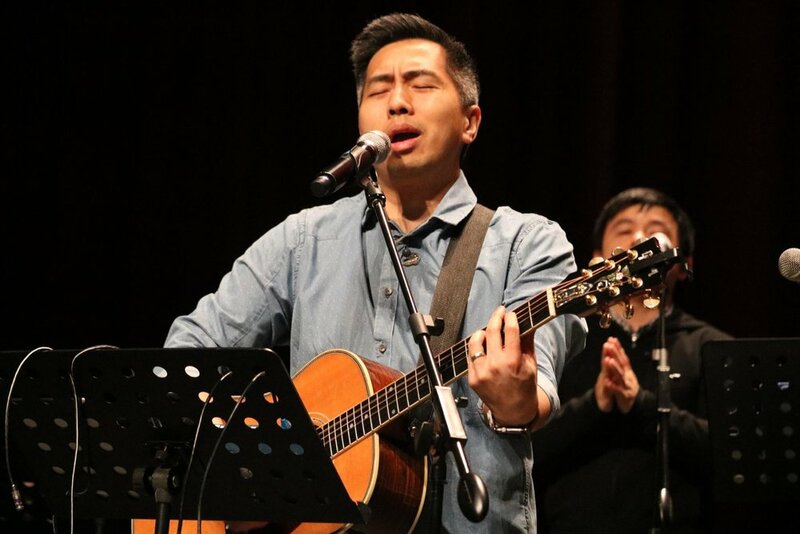 This is about going deeper and higher in worship and praise together (Psalm 24). As His people and nations gather to worship Him, God sends rain and His clouds of glory for us to abide in. This is a meditation on resting in God’s embrace, under the shadow of His wings - especially when we feel fragile and vulnerable like vapour. Feeling groans in the spirit realm over North Korea. 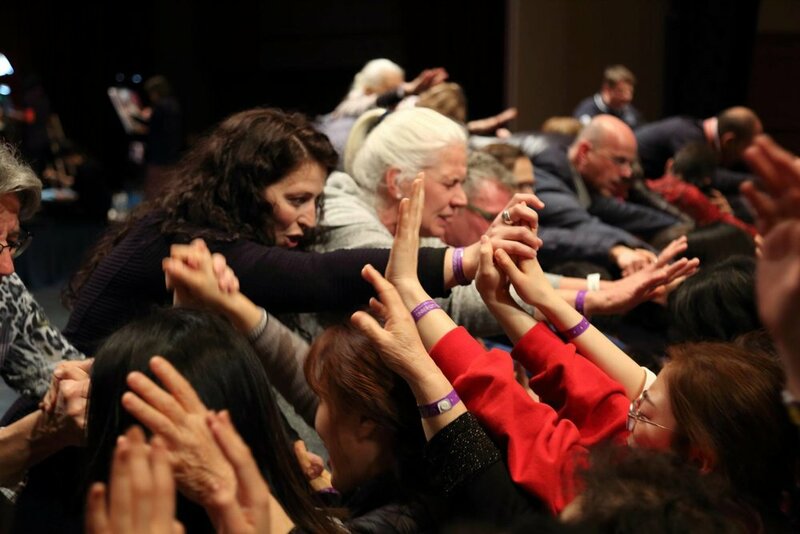 China, Japan and Korea bouncing in God’s hands with great joy! Painted during the covenant that was made with China, Japan and Korea, on rice paper, by a traditional method. What is done on earth is done in heaven. In the rainbow, we stood with Jesus. God’s promises and love. In the vision, the child is North Korean. And as I painted, my prayer was to make the child smile. Power to make the children smile. I sensed great joy during worship and realized that even all the joy had to be covered by Jesus’ Blood, so I set the cross of Jesus. The petals and butterfly are the pattern of the kimono that Japan presented to Korea at the gathering. The Lord proposed to One Bride. There are no boundaries to the Lord. True freedom! Gift to the North Korean pastors.